128 THE SHOP NOVEMBER 2018 \\\\\\\\\\\\\\\\\\\\\\\\\\\\\\\\\\\\\\\\\\\\\\\\\\\ \\\\\\\\\\\\\\\\\\\\\\\\\\\\\\\\\\\\\\\\\\\\\\\\\\\ CON 4x4's latest creation is its first Bronco BR Derelict. 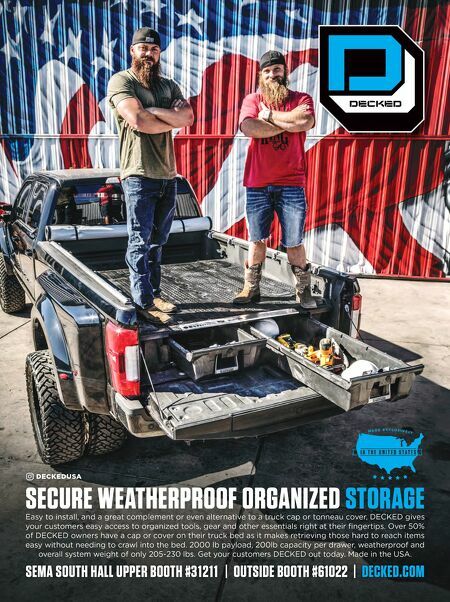 When the truck was complete, but prior to delivery, Jonathan Ward, ICON founder/lead designer, collaborated with famed nature photographer Shane Russeck to create a limited-edition photo to help raise money for the American Wild Horse Campaign. In a project loosely inspired by Ford's 1966 ad campaign for the original Bronco, Ward and Russeck set out to photograph the ICON Derelict with a herd of wild mus- tangs in Central California. "The shot we wanted to get was one-in- a-million," Ward says. "We hit the jackpot. To experience the mustangs' majesty in the wild was an amazing experience. They face so many challenges in the modern world." The ICON BR Derelict used for the project is a rare 1966 Roadster model. Only offered that year, it featured no heater, no radio, no doors, no top and fiberglass door inserts. ICON retained the existing body and all of the related factory features, then added a factory knob to provide Bluetooth sound through Focal speakers hidden under the dash. Otherwise, the vehicle received the bespoke ICON BR treatment. "It's made to look like we did absolutely nothing from the exterior," Ward explains. "That sounds easy, but it's actually harder than our normal process. We had to be very forensic. We also faux patina-painted some of the new components, like the modified Tuffy center console and adjustable ididit steering column. That 'faux' concept hurts my brain, but it actually works when done right." Power comes from a 426-hp Mustang GT 5.0-liter Coyote crate engine mated to an Aisin AX15 5-speed manual trans- mission. A twin-stick Advance Adapters Atlas II transfer case sends power to the axles. "This is the first of what we hope will be many Derelict BRs," Ward adds. "They're entirely too much fun." As for the photo shoot, the resulting limited-edition print of the image is called American Horse Power, and a portion of its sales goes to the American Wild Horse Campaign to protect America's wild mus- tangs on public land. Visit shanerusseck- photo.com/american-horse-power. A version of this article originally appeared on THE SHOP's website and in our daily eNews- letter. Learn more at theshopmag.com. A 'Bronco' Photo Shoot to Remember I \\\\\\\\\\\\\\\\\\\\\\\\\\\\\\\\\\\\\\\\\\\\\\\\\\\\\\\\\\\\\\\\\\\\\\\\\\\\\\\\\\\\\\\\\\\\\\\\\\\\\\\\\\\\\\ ONE MORE THING... A photo shoot for ICON 4x4's old-is-new-again Bronco BR Derelict was based in part on a Ford ad from 1966. 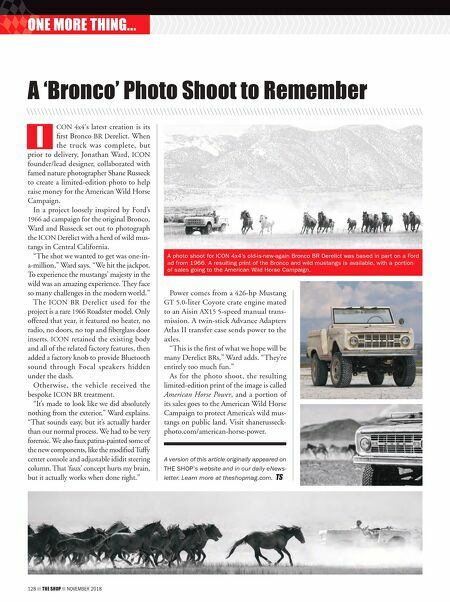 A resulting print of the Bronco and wild mustangs is available, with a portion of sales going to the American Wild Horse Campaign.